The papyrus plant functions well as a focal point within aquatic plant arrangements, especially when it is surrounded by shorter plants. Although papyrus flowers aren’t breathtaking, it is considered the ideal architectural plant among pond owners due to its height at maturity, as well as its stalk sleekness and impressive umbels. Below are some tips for growing and maintaining it the right way. Papyrus is considered sedge, which makes it a relative of grass. It is a plant which is grass like in appearance, with stems that are triangular and flowers which are largely inconspicuous. It thrives in areas which are wet, and is believed to originate in Egypt near the Nile, where it was harvested by the Egyptians. Their size at maturity depends on a number of factors, most important of which is the location in which they are grown. In a North American backyard pond, papyrus can reach a maximum height of eight feet. In Ancient Egypt it is believed they attained heights of fifteen feet. The stem will emerge from the clump, and under it is a rhizome mass which is thick, which helps the plant to spread. The umbel can be seen on top, and the flowers which are brownish green will blossom during summer. Papyrus is native to Africa and as such is tropical. Therefore, to thrive in North American ponds special conditions must be maintained. First, it must be planted in a zone which is rated eight or warmer. These plants love sunlight, as well as soil which is rich and wet. Second, they must be protected from strong winds. Overall, Papyrus doesn’t require a great deal of work when they’re treated like annuals. Those who live in warmer climates, such as the American south or southeast, should consider dividing them during spring to maintain their vigor. When dividing them, be sure to trim the aging rhizomes which are less healthy. Any vegetation which becomes brownish should be cleaned. If you lack compost which can be used for amending your soil and have to use a store brought product, be sure to add a fertilizer which is balanced and ensure the plant is watered sufficiently. 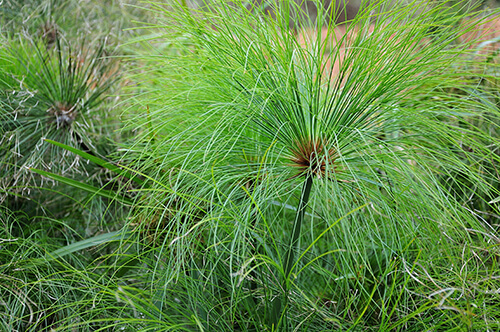 Papyrus is a tough plant which has been prized for its durability. Even in cases where it appears to be dead it might not be. When the foliage turns brown, the stem should be trimmed to about two inches above ground and then provided water. After a few weeks fresh shoots which are green in color may emerge. Papyrus is one of the most historically important plants you can add to your pond. It was referenced in the Old Testament and was used as writing material by the Ancient Egyptians up until the 8th century, after which it was phased out in favor of parchment. It was also used for food, medicine and construction.